Mozi (/ˈmoʊˈtsiː/; Chinese: 墨子; pinyin: Mòzǐ; Wade–Giles: Mo Tzu /ˈmoʊˈtsuː/; Latinized as Micius /ˈmɪsiəs/; c. 470 – c. 391 BC), original name Mo Di (Chinese: 墨翟), was a Chinese philosopher during the Hundred Schools of Thought period (early portion of the Warring States period of c.475–221 BC). A book named after him, the Mozi, contains material ascribed to him and his followers. Born in what is now Tengzhou, Shandong Province, he founded the school of Mohism that argued strongly against Confucianism and Taoism. His philosophy emphasized self-restraint, self-reflection and authenticity rather than obedience to ritual. During the Warring States period, Mohism was actively developed and practiced in many states but fell out of favour when the legalist Qin dynasty came to power in 221 BC. During that period, many Mohist classics are by many believed to have been ruined when the emperor Qin Shi Huang supposedly carried out the burning of books and burying of scholars. The importance of Mohism further declined when Confucianism became the dominant school of thought during the Han Dynasty, until mostly disappearing by the middle of the Western Han dynasty. Mozi was a carpenter and was extremely skilled in creating devices (see Lu Ban). Though he did not hold a high official position, Mozi was sought out by various rulers as an expert on fortification. He was schooled in Confucianism in his early years, but he viewed Confucianism as being too fatalistic and emphasizing too much on elaborate celebrations and funerals which he felt were detrimental to the livelihood and productivity of common people. He managed to attract a large following during his lifetime which rivaled that of Confucius. His followers—mostly technicians and craftspeople—were organized in a disciplined order that studied both Mozi's philosophical and technical writings. Mozi tried to replace what he considered to be the long-entrenched Chinese ideal of strong attachments to family and clan structures with the concept of "impartial caring" or "universal love" (兼愛, jiān ài). He argued directly against Confucians, who had philosophized that it was natural and correct for people to care about different people in different degrees. Mozi, in contrast, argued that people in principle should care for all people equally, a notion that philosophers in other schools found absurd, as they interpreted this notion as implying no special amount of care or duty towards one's parents and family. Overlooked by those critics, however, is a passage in the chapter on "Self-Cultivation" which states, "When people near-by are not befriended, there is no use endeavoring to attract those at a distance." This point is also precisely articulated by a Mohist in a debate with Mencius (in the Mencius), where the Mohist argues in relation to carrying out universal love, that "We begin with what is near." Also, in the first chapter of the writings of Mozi on universal love, Mozi argues that the best way of being filial to one's parents is to be filial to the parents of others. The foundational principle is that benevolence, as well as malevolence, is requited, and that one will be treated by others as one treats others. Mozi quotes a popular passage from the Book of Odes to bring home this point: "When one throws to me a peach, I return to him a plum." One’s parents will be treated by others as one treats the parents of others. In pursuing this line of argument, Mozi was directly appealing to the idea of enlightened self-interest in social relations. Also of note is the fact that Mozi differentiated between "intention" and "actuality", thereby placing a central importance on the will to love, even though in practice it may very well be impossible to bring benefit to everyone. In addition, Mozi argued that benevolence comes to human beings "as naturally as fire turns upward or water turns downward", provided that persons in positions of authority illustrate benevolence in their own lives. In differentiating between the ideas of "universal" (jian) and "differential" (bie), Mozi said that "universal" comes from righteousness while "differential" entails human effort. Furthermore, Mozi's basic argument concerning universal love asserts that universal love is supremely practical, and this argument was directed against those who objected that such love could not be put into practice. Mozi also held a belief in the power of ghosts and spirits, although he is often thought to have only worshipped them pragmatically. In fact, in his discussion on ghosts and spirits, he remarks that even if they did not exist, communal gatherings for the sake of making sacrificial offering would play a role in strengthening social bonds. Furthermore, for Mozi the will of Heaven (天, tiān) was that people should love one another, and that mutual love by all would bring benefit to all. Therefore, it was in everyone's interest that they love others "as they love themselves". Heaven should be respected because failing to do so would subject one to punishment. For Mozi, Heaven was not the "amoral", mystical nature of the Taoists. Rather, it was a benevolent, moral force that rewarded good and punished evil. Similar in some ways to the Abrahamic religions, Mozi believed that all living things live in a realm ruled by Heaven, and Heaven has a will which is independent from and higher than the will of man. Thus he writes that "Universal love is the Way of Heaven", since "Heaven nourishes and sustains all life without regard to status." ("Laws and Customs" in Mozi) Mozi's ideal of government, which advocated a meritocracy based on talent rather than background, also followed his idea of Heaven. Anti-fatalism(非命)- Mozi opposed to Confucian "Destiny" thought, class differences and other ideas. Mozi put forward to promote people's victory, things in the subjective attitude to life, encourage people to work hard to change their fate and inequality in the world. In Confucius's opinion, a person's life and death, wealth and poverty are completely related to destiny and personal power can not be changed. Mohist ethics are considered a form of consequentialism, sometimes called state consequentialism. Mohist ethics evaluates the moral worth of an action based on how it contributes to the stability of a state, through social order, material wealth, and population growth. According to the Stanford Encyclopedia of Philosophy, Mohist consequentialism, dating back to the 5th century BC, is the "world's earliest form of consequentialism, a remarkably sophisticated version based on a plurality of intrinsic goods taken as constitutive of human welfare". Unlike hedonistic utilitarianism, which views pleasure as a moral good, "the basic goods in Mohist consequentialist thinking are ... order, material wealth, and increase in population". During Mozi's era, war and famines were common, and population growth was seen as a moral necessity for a harmonious society. Mozi opposed wars because they wasted life and resources while interfering with the fair distribution of wealth, yet he recognized the need for strong urban defenses so he could maintain the harmonious society he desired. The "material wealth" of Mohist consequentialism refers to basic needs like shelter and clothing, and the "order" of Mohist consequentialism refers to Mozi's stance against warfare and violence, which he viewed as pointless and a threat to social stability. Stanford sinologist David Shepherd Nivison, in The Cambridge History of Ancient China, writes that the moral goods of Mohism "are interrelated: more basic wealth, then more reproduction; more people, then more production and wealth ... if people have plenty, they would be good, filial, kind, and so on unproblematically". In contrast to Jeremy Bentham, Mozi did not believe that individual happiness was important; the consequences of the state outweigh the consequences of individual actions. Some views claim that Mozi's philosophy was at once more advanced and less so than that of Confucius. His concept of "universal love" embraced a broader idea of human community than that of the Confucians, but he was less tolerant than Confucius in his condemnation of all that is not directly "useful", neglecting the humanizing functions of art and music. Zhuangzi, who criticized both the Confucians and the Mohists, had this in mind in his parables on the "usefulness of the useless". Of course, this insistence on usefulness comes from a time when war and famine were widespread and could well have made all the royal pageantry look frivolous. In 2016, a joint Austrian-Chinese initiative between the experimental physics groups of Anton Zeilinger and former graduate student Jian-Wei Pan known as Quantum Experiments at Space Scale launched a quantum communications satellite nicknamed "Micius" or "Mozi" in homage to the philosopher's writings on optics. ^ "Mo-Zi". Collins English Dictionary. ^ "Mozi". Collins English Dictionary. ^ Hansen, Chad (1992). A Daoist Theory of Chinese Thought: A Philosophical Interpretation. Oxford University Press. p. 394. ISBN 978-0-19-506729-3. There was a fleeting movement to introduce use of Micius for Mozi, whose bones no doubt relaxed when the movement failed. ^ Průšek, Jaroslav and Zbigniew Słupski, eds., Dictionary of Oriental Literatures: East Asia (Charles Tuttle, 1978): 119-120. ^ Fraser, Chris (2002). "Mohism". "The Stanford Encyclopedia of Philosophy". ^ Needham & Wang 1956 165. ^ Needham & Wang 1956 165–184. ^ Cui, Dahua (2009-09-01). "Rational awareness of the ultimate in human life – The Confucian concept of 'destiny'". Frontiers of Philosophy in China. 4 (3): 309–321. doi:10.1007/s11466-009-0020-7. ISSN 1673-3436. ^ a b Van Norden, Bryan W. (2011). Introduction to Classical Chinese Philosophy. Hackett Publishing. p. 52. ISBN 978-1-60384-468-0. ^ a b c Loewe, Michael; Shaughnessy, Edward L. (2011). The Cambridge History of Ancient China. Cambridge University Press. p. 761. ISBN 978-0-521-47030-8. ^ Tignor, Robert; Adelman, Jeremy; Brown, Peter; Elman, Benjamin; Liu, Xinru; Pittman, Holly; Shaw, Brent (2013-10-24). Worlds Together Worlds Apart Volume One: Beginnings Through the 15th Century (Fourth ed.). W.W. Norton. p. 167. ISBN 9780393922080. ^ Han Yu: "Universal love" (博愛, Boai) means Ren (Humanity) (韓愈: 博愛之謂仁). ^ "No. 2080 The Survival of Invention". www.uh.edu. ^ FENRONG, LIU; JIALONG, ZHANG. "NEW PERSPECTIVES ON MOHIST LOGIC". Journal of Chinese Philosophy. 37 (4): 605–621. ^ "China launches world's first quantum science satellite - physicsworld.com". physicsworld.com. Retrieved 2018-01-12. ^ "Micius Quantum Communication Satellite – Aerospace Technology". Aerospace Technology. Retrieved 2018-01-12. ^ "China launches quantum satellite". BBC News. 2016-08-16. Retrieved 2018-01-12. Knechtges, David R. (2010). "Mozi 墨子". In Knechtges, David R.; Chang, Taiping (eds.). Ancient and Early Medieval Chinese Literature: A Reference Guide, Part One. Leiden: Brill. pp. 677–81. ISBN 978-90-04-19127-3. Needham, Joseph; Wang, Ling (1956). Science and Civilization in China. 2. History of Scientific Thought. Cambridge University Press. ISBN 978-0-521-05800-1. . (Printings were 1956, 1962, 1969) See also the 1986 edition published in Taipei by Caves Books Ltd.
Cui, D. (2009). Rational awareness of the ultimate in human life—The Confucian concept of "destiny". Frontiers of Philosophy in China, 4(3), 309–321. Bertolt Brecht. Me-ti. Buch der Wendungen. Suhrkamp, Frankfurt 1971. * Wing-tsit Chan, ed. A Source Book in Chinese Philosophy. Princeton University Press, Princeton 1969, ISBN 0-691-01964-9. Wejen Chang, Traditional Chinese Jurisprudence: Legal Thought of Pre-Qin Thinkers. Cambridge 1990. Chris Fraser, The Philosophy of the Mòzi: The First Consequentialists, New York, Columbia University Press, 2016. Jane Geaney, “A Critique of A. C. Graham's Reconstruction of the ‘Neo-Mohist Canons,’” Journal of the American Oriental Society, 119, no. 1 (1999), pp. 1–11. Anna Ghiglione, Mozi, complete translation from classical Chinese, annotated and commented, Québec, Les Presses de l’Université Laval, 2018. Series « Histoire et cultures chinoises », edited by Shenwen Li. Chad Hansen, "Mozi: Language Utilitarianism: The Structure of Ethics in Classical China," The Journal of Chinese Philosophy 16 (1989) pp. 355–380. Kung-chuan Hsiao. A History of Chinese Political Thought. In: Volume One: From the Beginnings to the Sixth Century A.D.. Princeton University Press, Princeton 1979 (übersetzt von F. W. Mote). 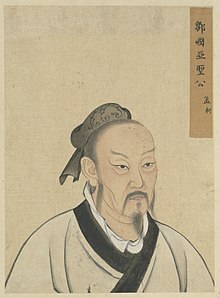 Y. P. Mei Mo-tse, the Neglected Rival of Confucius. London: Arthur Probsthain, 1934. Ralf Moritz, Die Philosophie im alten China. Deutscher Verlag der Wissenschaften, Berlin 1990, ISBN 3-326-00466-4. Peter J. Opitz, Der Weg des Himmels: Zum Geist und zur Gestalt des politischen Denkens im klassischen China. Fink, München 1999, ISBN 3-7705-3380-1. Helwig Schmidt-Glintzer, (ed. ), Mo Ti: Von der Liebe des Himmels zu den Menschen. Diederichs, München 1992, ISBN 3-424-01029-4. Aronovich Rubin Vitaly, Individual and State in Ancient China: Essays on Four Chinese Philosophers. Columbia University Press, New York 1976, ISBN 0-231-04064-4. Robin D. S. Yates, "The Mohists on Warfare: Technology, Technique, and Justification", Journal of the American Academy of Religion, 47, mo. 3 (1980, Thematic Issue S), pp. 549–603. This page is based on the Wikipedia article Mozi; it is used under the Creative Commons Attribution-ShareAlike 3.0 Unported License (CC-BY-SA). You may redistribute it, verbatim or modified, providing that you comply with the terms of the CC-BY-SA.